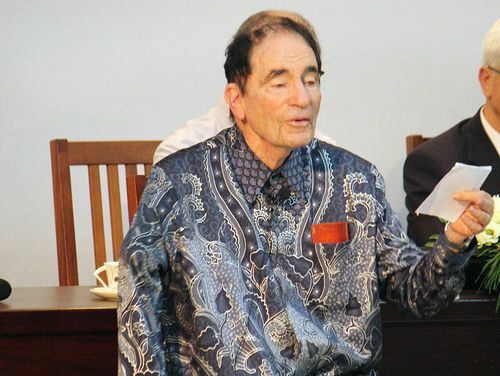 Taichung, Sept. 20 (CNA) South African lawyer Albie Sachs, who won the first-ever Tang Prize in Rule of Law Sept. 18, shared his life story and insights in a lecture at National Chung Hsing University in central Taichung Saturday. The 79-year-old former justice of the Constitutional Court of South Africa said that the rule of law cannot just be a mechanism, but should tolerate multivariant opinions and ideas and respect everyone. The law should embrace perspectiveness and transcend limitation, he added. C.V. Chen, a prominent lawyer and former head of the Red Cross Society of the Republic of China, told the audience after the lecture that he was moved to tears when he learned of the human rights activist's life. Sachs, a lawyer and human rights activist who spent his lifetime fighting apartheid, helped write the new Constitution of South Africa and was appointed by the late South African President Nelson Mandela in 1994 to serve as a justice of the Constitutional Court -- a position he held until 2009. During the 1980s, Sachs helped draft the Code of Conduct and Statutes for the African National Congress (ANC), which prohibits the torture of detainees under any circumstances. In 1988, South African security agents planted a bomb in his car that blew off his right arm and blinded him in one eye, a story recounted in his autobiography titled "The Soft Vengeance of a Freedom Fighter." "When I first read his book, I had tears in my eyes, and when I learned that he is one of the inaugural Tang Prize laureates, I was in tears again," Chen said. Chen also urged young students to become people with passion who care about society. "We shouldn't be indifferent. Instead, we should use our passion, intuition and empathy to care about the world," he said.